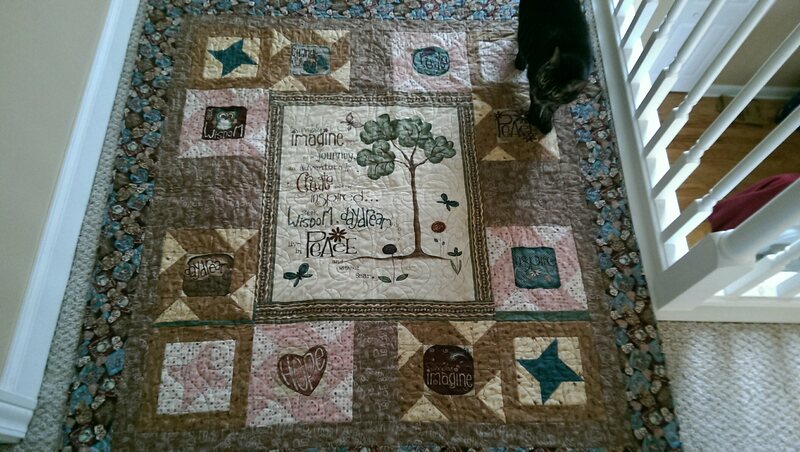 Last week, my friend Pat gave me this quilt, which she designed and sewed especially for me. It’s so beautiful even Rosa wanted a closer look. It’s a timely reminder for two friends who are cancer survivors. But cancer isn’t the only link Pat and I share. We have a long history as acquaintances and two stints working together — first with me as Pat’s boss, and then with Pat as mine. Now we’re good friends who share a love of fresh, local food, good books, walking, and trying new things. When I look at my quilt, I see our friendship, pieced together — block by block — over time. This made me think about other friends, and what their quilts would look like. For my friend Mary, I envision a field of parrots and margaritas. Florence’s and Barb’s would be “postage stamp” quilts filled with tiny pieces of all colors, representing individual days spent with friends I’ve known for longer than I care to admit. Carole T.’s quilt would feature tennis shoes and photos of the lake. And there would be others, filled with soccer balls and books, bicycles, and planes. Like friends, some quilts have a single motif or theme, while others are made of blocks of brightly colored material, bits and pieces that seem to have nothing in common. How do we create a friendship? We piece it together, just like a quilt, with blocks of color, laughter, sorrow, joy, and love. What would your friendship quilts look like? This entry was posted in Uncategorized and tagged friends, piecing a quilt, quilting. Bookmark the permalink. Are you sure you’re not a quilter at heart? Thanks for an article that sums up what I try to do with my quilts, and you do with your writing, and others do with music, painting, jewelry making, etc. Hobbies, passions, callings are a way to make sense of the world and add a little color in many different ways. Exactly! And it’s a beyooootiful quilt! I can’t do justice to it with words. Are you sure you’re not a quilter at heart? What a wonderful post, and a lovely tribute to friendships of all kinds. That is a beautiful quilt. How special you must feel to know someone put in the effort to make such a beauty for you!